When I think about summer I think about ice cream trucks, bonfires, grilling, and endless happiness. My favorite summertime treats are mostly cold and refreshing. I love an ice cream cone heaping with creamy strawberry ice cream (but I hate when it melts all over my hands). I love watermelon, lots and lots of watermelon. I love grilled chicken and corn on the cob… One of my favorite treats though happens to be root beer floats. There is just something about the way the creaminess of the vanilla ice cream and the cold refreshing root beer taste after a long Summer day. I wanted to change it up a little bit… I wanted to be able to take those same great flavors with me everywhere I go. I wanted to be able to eat a root beer float anytime, anywhere. That’s when I thought about a root beer float Rice Krispies treat. Try this recipe… you will thank me later. Prepare a 8×8 inch or 13×9 inch pan with shortening; set aside. In a large saucepan melt butter over low heat. Add in marshmallows and vanilla extract once the butter has melted. Stir until you have a thick marshmallow sauce. Slowly stir in vanilla pudding mix. Once combined remove from heat and stir in the Rice Krispies Cereal. Using a greased spatula press mixture into prepared pan; set aside. In a large saucepan melt butter over low heat. Add in the marshmallows and stir until you have a thick marshmallow sauce. Stir in the root beer extract. Once combined stir in your (optional) food coloring. Remove from heat and mix in the Rice Krispies cereal. Using a greased spatula press root beer mixture into same pan as before on top of the vanilla ice cream Rice Krispies layer. Cool on the countertop for approximately 30 minutes. 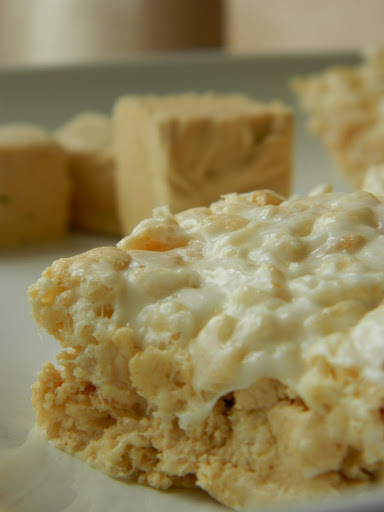 Once the Rice Krispies have cooled, melt the white chocolate with the vanilla extract. Once melted pour into a small ziplock bag. 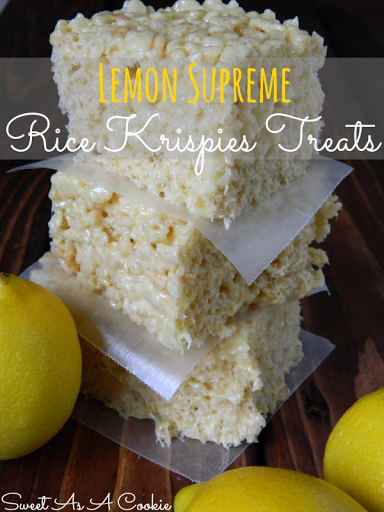 Cut off a corner of the bag and drizzle the white chocolate over the Rice Krispies Treats. Allow white chocolate drizzle to harden and enjoy! This entry was posted in Bars, Dessert, Rice Krispies. Bookmark the permalink. ← Printer Friendly and an Update! I love these so much! Root beer is one of my favorite flavors! Mine too! It's so refreshing. Yum, these turned out great! and tasted great to.